ATS2020 project has developed a transversal skills framework intended for school experimentation. Drawing on previous work published with regard to 21st century skills (e.g. 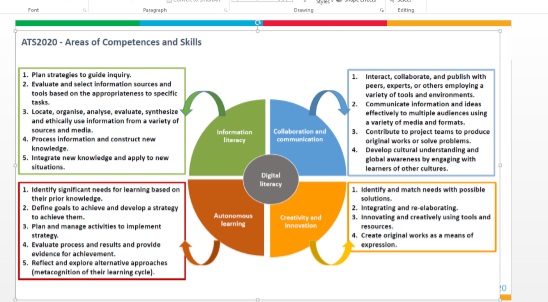 ISTE STANDARDS, IPTS framework, Key Skills of Junior Cycle (NCCA), DIGCOMP( JRC) ATS2020 Competences and Skills framework identifies four main areas namely: Information Literacy, Collaboration &Communication, Autonomous Learning, Creativity and Innovation. Digital Literacy is placed at the centre as a distinctive skills area that permeates all other four. Information Literacy refers to the skills that will enable students to conduct research on the web or in physical space. It entails setting strategies for research, locating, managing and evaluating data to the best interest of the project. Autonomous Learning refers to a self- reflective process which enables students to get hold of their own learning. It entails setting individual learning goals, assessing current status of knowledge, developing strategies to fill the gaps and achieve learning goals, as well as deciding on how to best evidence achievement. Collaboration and Communication includes the development of skills which enables students and individuals in general to collaborate with people from different backgrounds on common projects, share ideas and content in physical and online space, engage in joint projects, produce and publish shared work. Creativity and Innovation urges students to explore their imagination and creative minds. It is about identifying needs in existing circumstances, exploring solutions, using existing tools and resources to produce works of originality and innovation, and effect change. The cross- cutting area of Digital Literacy refers to the necessary skills for performing multiple digital functions and using digital applications and tools in an effective and responsible way.